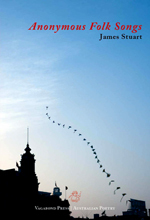 On the cover of James Stuart’s debut collection Anonymous Folk Songs is an image of a series of kites strung together; tethered to a darkened cityscape, they stretch away from it, curving upwards into the sky above. In any scene where the light falling upon subjects differs, the photographer must choose which part of the image to correctly expose – and therefore to highlight – the earth or sky, the kites or clouds. The photograph is Stuart’s own, and it is the sky that takes up most of the frame, that retains depth and a complexity of colour and tone. And yet the unbroken black silhouette of an urban skyline anchors the sky, just as a barely visible line of string anchors the desiring kites to ground. The same impulse that animates this image on the cover is embedded in the poems within. Stuart’s anchors are often a recognisable Australia, in both its rural and urban manifestations, and a similarly distinct Asia, In poems such as ‘Blow-ins’, populated with mynas, eucalypts and ‘spinifex spanning ridges’, and ‘Hội An’, set amongst ‘paper-lantern streets’, ‘ivory charms’ and incense, we are clearly in particular, defined spaces. In others, the borders blur: ‘Sudden rain, Tilba Tilba’ begins with a quote from a Qing Dynasty painter, before opening on a vista of fly-screen doors, hills ‘scraped…bare/of spotted gums & blackbutts’, and the ‘fruit preserves/& 70s bric-à-brac’ of a gentrified Australian country town. But time after time we return to these homelands only to depart. A scene soon shifts to the country roads of northern France, a poker tournament in Indiana, USA, a white beach near Santiago, before looping back, then out again. Stuart encourages this sense of the itinerant by, among other methods, subverting expectations of sequence: a piece titled ‘Crossing’, for example, in which the Channel Nine news and Sydney Harbour Bridge are featured, breaks the apparent continuity between the poems ‘Huế’ and ‘Hội An’ (both cities in Vietnam) on either side. As we move between landscapes – often within the same poem – the impermanence and instability of places is transposed to our experience of reading. We are never allowed to settle comfortably into any particular setting, depend on any particular context of knowing; we lose our bearings, gain them, lose them again. These cinematic jump-cuts are both disorienting and liberating, yet behind the constant oscillation between named, visible landscapes, something more amorphous is at work; some other anchor pulls in the sand. There is much that is meditative and reflective in Anonymous Folk Songs, but look closer and you’ll find that in every evocation of a well-kept lawn or Matsu temple there are small perforations through which a different kind of light leaks. Often occasioned by a mere line or two that alters the colour of a scene, or registers a barely noticeable but significant shift in temporality, they are what give many of the poems in this collection their nuanced and distinctive atmosphere. Layered beneath these ‘anonymous folk songs’ is a persistent hum of disquietude; a sharp edge pushing its way to the surface from the bottom of a still pool of dreams. The surreal and the dream-like recur in the collection, most notably in poems such as ‘Soundtrack to the end of the world’, where the light-hearted discussion of a hypothetical ‘end of the world’ scenario between friends suddenly becomes a reality. The compelling final image is both beautifully executed and, considering the casual, dryly humorous delivery of what precedes it, entirely unexpected. ‘Why is he doing this? He’s a great guy, a family man. The cut-up method is also used in ‘Degustation’ to great effect, where, we are told, ‘making new memories with old friends/is just a way of life: 97% fat free’. Stuart is no stranger to postmodern techniques: elsewhere, his work shows a sustained interest in contemporary and experimental poetics. The e-anthology The Material Poem, edited by Stuart (and reviewed here), is an example of his engagement with questions of materiality and hybridity in poetic form, particularly with respect to new media. While these concerns are largely absent in this collection, perhaps solely by virtue of the constraints imposed by the material book form, Anonymous Folk Songs is evidence of the wide territory over which Stuart’s poetic interests and practices range. The poems in Anonymous Folk Songs were composed over more than a decade. As a debut collection it is assured, intelligent, often very funny, and rewards close reading. There is much to appreciate here: different notes will of course be sounded to different ears in the process of reading; and each reading, too, produces its own metamorphoses of meaning. Given Stuart’s engagement with questions of materiality and more experimental forms, it will be interesting to see if and how this influences the shape of collections to come. To return to the book’s cover image: we see that each kite, in each successive, skyward iteration, increasingly resembles a bird in flight. This entry was posted in BOOK REVIEWS and tagged Bella Li, James Stuart. Bookmark the permalink.